Venice is one of the few cities in the world that can truly be described as unique. Built on water, this former maritime superpower is now a tourist haven filled with stunning architecture, phenomenal artistic treasures and a maze of breathtaking waterways. We understand you’ll want to be in your hire car and out on the road as soon as you arrive in Venice, which is why we have several pick-up locations dotted around the city. You’ll also find us at Venice Airport, which is handily located for easy access to the other delights that this part of Italy has to offer. Prepare to be enthralled by the never-ending delights of Venice – Gothic and Baroque churches, extravagant palazzi, romantic canals, and galleries stuffed with artistic masterpieces. With so much going on in this water city, it will be hard to know where to begin. For most visitors the first port of call is Piazza San Marco, described by Napoleon as “the finest drawing room in Europe”. It’s the perfect introduction to the city and a good place to find your bearings before ducking into the labyrinth of narrow, winding alleyways, canals and bridges. Take in the Basilica of San Marco – a stunning architectural feat covered in intricate mosaics, imposing domes and beautifully crafted walkways. The Doge’s Palace, Venice’s most famous building, and St. Mark's Campanile, the bell tower, are also incredible attractions that you can marvel at while in St Mark’s Square. Everywhere you turn in Venice you’ll find treasured works of art. The Madonna dell’Orto church on the edge of town is filled with the art of the young Tintoretto, whose tomb lies within. The Santa Maria Gloriosa dei Frari, a huge Franciscan Gothic church, holds some of Venice’s most treasured art works, including Titian’s Assumption. For a masterclass in Renaissance art, head to the Gallerie dell’Accademia. Lotto, Titian, Tintoretto and Veronese will be vying for your attention as you make your way around this stunning building. A short stroll from the Gallerie dell’Accademia is where you’ll find the Peggy Guggenheim Collection. Housed in a palazzo on the Canal Grande, you’ll be treated to an unrivalled collection of surrealist and abstract art from the likes of Picasso, Dali and Hans. Travel further afield from the city of Venice in your rentall car to take in all the Veneto region has to offer. Vicenza is around an hour’s drive away from Venice and is packed full of sights and activities to enjoy. As one of Italy’s richest architectural cities, it boasts many of Palladio’s finest palazzi, including his masterpiece, La Rotonda, standing proudly in the surrounding countryside. To the north, Treviso is a medieval, fortified and moated city with a slower pace of life. With its own network of canals, Treviso is the perfect place to get a true sense of the area away from the tourist crowds. If you’re keen to venture a little further afield, jump in your hire car and travel around two hours to Lake Garda. With water sports, vast parks and an ever changing landscape, this idyllic setting is the perfect place to spend time with family. 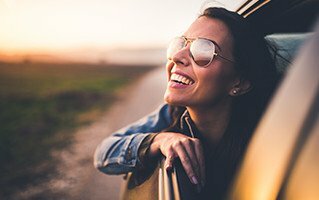 Car rental in Venice is a great way to see all that this magnificent region of Italy has to offer. Famous for being a city built on a series of islands, Venice is well known for its car-free streets. But you can still drive across to the city via the SR11, park up in one of the many car parks and continue on foot. You’ll find Marco Polo Airport is around a 15-minute drive away from Venice, and car rental here opens up the rest of Northern Italy for you.Treviso is around a 40-minute drive north from Venice and makes for a wonderful day out. Medieval city walls, awe-inspiring churches and its very own network of canals makes this a place that should be on your must-see list. 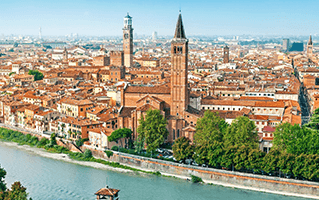 To the west of Venice along the E70 is where you’ll find the idyllic city of Verona. The setting for Shakespeare’s Romeo and Juliet, Verona is filled with historical sights. See the well-preserved 1st-century amphitheatre, fascinating bridges and churches, alongside the sights of the star-crossed lovers. Venice is well connected to many other big Italian cities, making it the perfect starting point for a road trip.The E70 is your gateway to some of the highlights of the Veneto region – Padua is 40 minutes west, you’ll make it to Vicenza in 50 minutes, while Verona is an hour-and-a-half 1/2 away. Treviso is lies 40 minutes north of the city via the A27. In Italy, as in the rest of continental Europe, you drive on the right-hand side of the road. Pay careful attention to speed limits on all roads and note that Italian motorways – autostrada – are toll roads (cash only) and indicated by green road signs.